Are horses more intelligent than previously assumed? Is your horse smarter than average? We’re trying to figure out whether horses which do something other horses don’t are more intelligent than their stable-mates, and we need your help! If your horse has its own special way of reaching the feed that fell behind the feeder, or uses a stick to poke the hay out from under the rack, or is a dab-hand at opening un-openable gates or any other feats of equine genius – we’d like to hear about it. Unusual, untrained behaviours such as these are called “innovative behaviour”, and they are one of the key factors scientists use to measure an animal’s intelligence. We’re particularly interested in horses which have come up with their own, creative ways to solve a problem or deal with a situation, and in horses using tools to achieve their objectives. If you can help us, please fill out the questionnaire and, if possible, send us photos and videos of your horse showing its talents! On behalf of our university and our project team we thank you very much for taking part and supporting scientific research into the intelligence of horses! 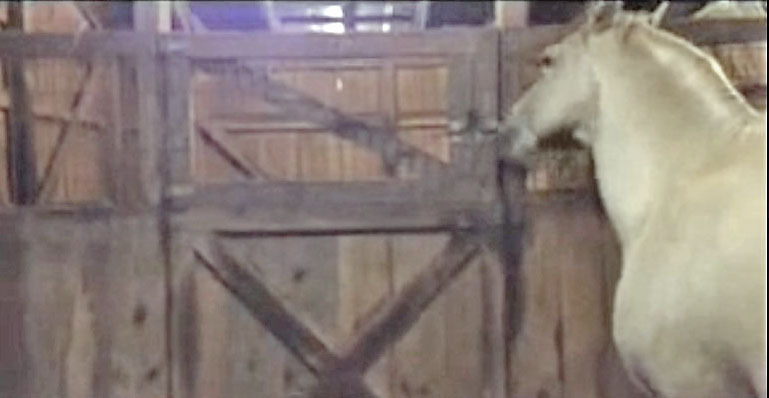 !New questionnaire on horses which open doors or gates! With the general questionnaire on innovative behavior 85 descriptions of horses opening doors or gates reached us so fare. Thank you very much! Because of the fact that so many horses appear to be very skilled in opening doors, we decided to give this ability a closer look. We would like to know as many details on the door or gate opening abilities as possible. It would be thrilling to find out whether horses show similarities, or develop individual solutions. Which kind of locks are easy, and which need “advanced” skills. If you own a horse or know of a horse which opens doors or gates,…. you could do us a great favor and fill out the special questionnaire on door opening! May be you can even upload a picture or a video.